Add this timeless charm surrounded with dozens of Swarovski clear crystals to your charm bracelet.What could be more fitting?Aquarius: January 20 – February 18Symbol - Water BearerAquarians are honest, loyal and very intelligent.Often artistic and poetic.Nickel and lead free. 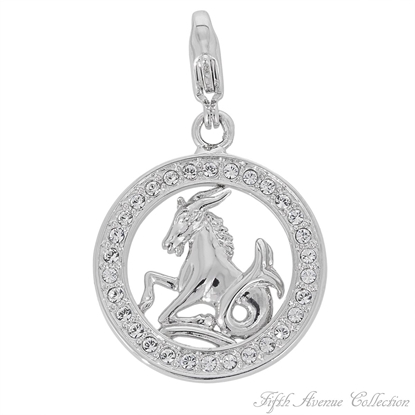 Add this timeless charm surrounded with dozens of Swarovski clear crystals to your charm bracelet.What could be more fitting?Aries: March 21 - April 19Symbol - The RamAggressive, adventurous and insightful.Are achievers with an excellent sense of humour.Nickel and lead free. Add this timeless charm surrounded with dozens of Swarovski clear crystals to your charm bracelet. What could be more fitting?Cancer: June 21- July 22Symbol - The CrabLove home life, family and domestic surroundings.They have the reputation of being fickle but that just not true.Nickel and lead free. Add this timeless charm surrounded with dozens of Swarovski clear crystals to your charm bracelet. What could be more fitting?Capricorn: December 22 - January 19Symbol - The GoatHighly intelligent and practical.Maintain stability and order.Can accomplish any task.Nickel and lead free. 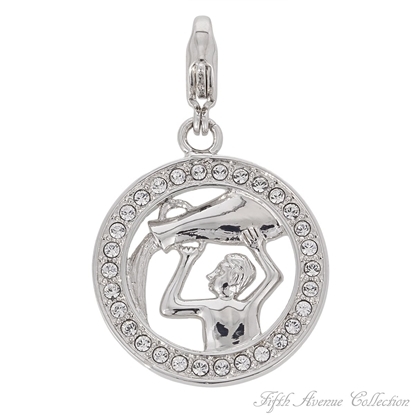 Add this timeless charm surrounded with dozens of Swarovski clear crystals to your charm bracelet. What could be more fitting?Gemini: May 21 - June 20Symbol- The TwinsQuick to grasp the meaning of a situation and act on it.Affectionate, imaginative and can naturally motivate themselves.Nickel and lead free. 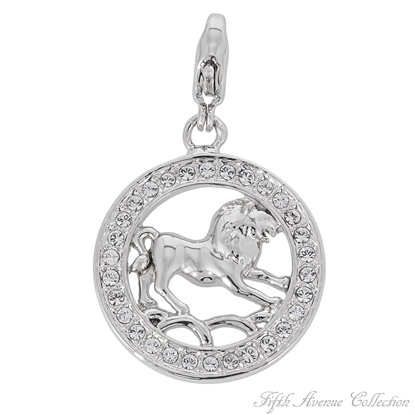 Add this timeless charm surrounded with dozens of Swarovski clear crystals to your charm bracelet.What could be more fitting?Leo: July 23 - August 22Symbol – The LionNatural born leaders.Beneath their dynamic persona lies a generous, loving and sensitive nature.At times might be a little bossy.Nickel and lead free. 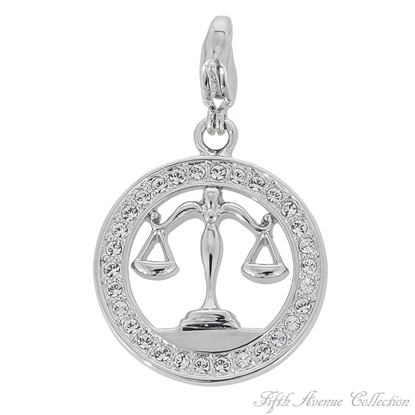 Add this timeless charm surrounded with dozens of Swarovski clear crystals to your charm bracelet.What could be more fitting?Libra: September 23 - October 22Symbol - The ScalesAll about balance, justice and stability.Can be shy, but in spite of that they can be excellent debaters.Nickel and lead free. 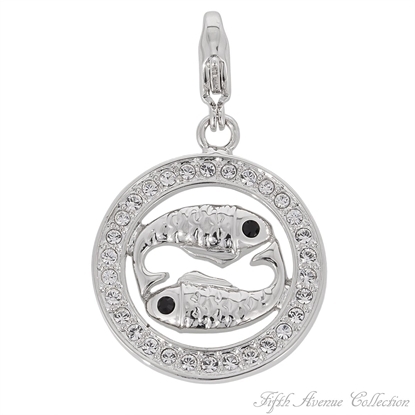 Add this timeless charm surrounded with dozens of Swarovski clear crystals to your charm bracelet.What could be more fitting?Pisces: February 19 - March 20Symbol - Two FishKnowledgeable, honest, trustworthy and unselfish.Devoted to family and friends.Nickel and lead free. 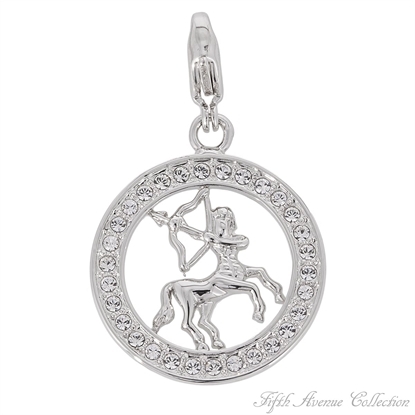 Add this timeless charm surrounded with dozens of Swarovski clear crystals to your charm bracelet.What could be more fitting?Sagittarius: November 22 - December 21Symbol - The Centaur with an arrowHave a great ability for focus and can be very intense.Impatient and expect quick results.Loyal to friends and lovers.Nickel and lead free. 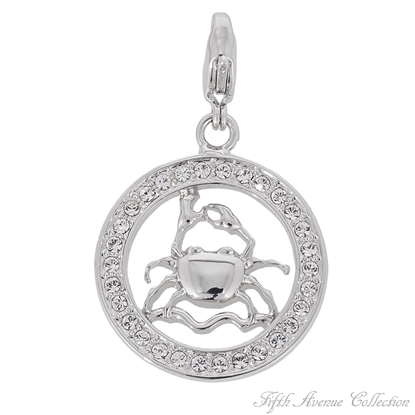 Add this timeless charm surrounded with dozens of Swarovski clear crystals to your charm bracelet.What could be more fitting?Scorpio: October 23 - November 21Symbol - The ScorpionBold personality with cool control and confidence.Forceful, vigorous and determined.Very secretive.Nickel and lead free. 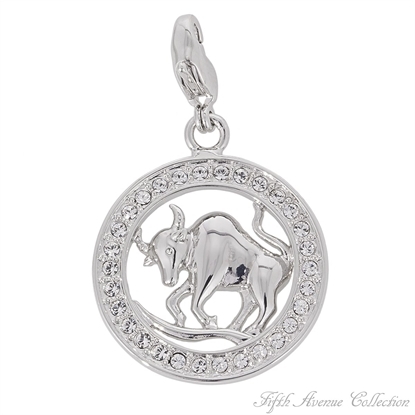 Add this timeless charm surrounded with dozens of Swarovski clear crystals to your charm bracelet.What could be more fitting?Taurus: April 20 - May 20Symbol - The BullAll about strength, stamina and will.Good business people.Nickel and lead free. 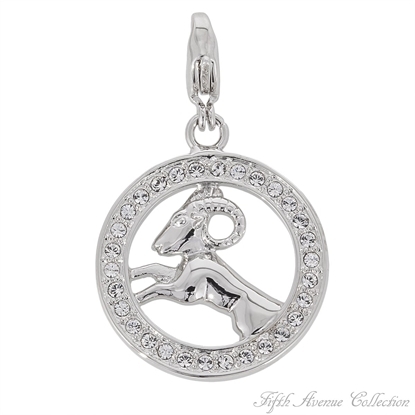 Add this timeless charm surrounded with dozens of Swarovski clear crystals to your charm bracelet.What could be more fitting?Virgo: August 23 - September 22Symbol - The VirginKeen minds and delightful to talk with because of their easy charm.Work well with others.Nickel and lead free.